Wi-Fi Mini PCI LAN adapter card 11a/b/g WMP-RT2561ST IEEE802.11a/b/g (Type III B slot Dual band 5 GHz and 2.4 GHz) compatible with windows, VISTA, MAC, Linux. It connects your notebook to a local wireless network or any avaiable wifi hotspots with 802.11a technique, WMP-RT2561ST expand the wireless connection efficiently as compared to the normal 802.11b/g products. 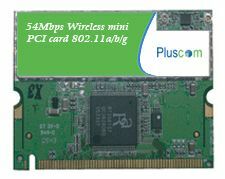 Pluscom WMP-RT2561ST Wireless Mini-PCI Card is based on Ralink RT2561ST wireless chipset. Download (For Windows 9x,Win2000/XP,Linux,WinCE, but this is old version, 12.9MB) from Pluscom. Download the latest driver for Pluscom WMP-RT2561ST from Ralink official, Driver Support Windows 2000, XP, Vista, Win 7, Released at 08/24/2009, Support Mac OS, Released at 12/04/2008. "Ralink Turbo Wireless LAN Card"
"Ralink Wireless LAN Card V2"
"Ralink MIMO Wireless LAN Card"
"Edimax EW-7108 Series 802.11g Wireless LAN PC Card"
"Edimax EW-7128 Series 802.11g Wireless LAN PCI Card"
"Billionton mini PCI Wireless Lan 11B/G card"
"mini PCI Wireless Lan 11B/G card"
"Sitecom Wireless Network PC Card 54G WL-112v2"
"Sitecom Wireless Network PCI Adapter 54G WL-115v2"
"Sitecom Wirless Network PC Card MiMoXR WL-150"
"Sitecom Wireless Network PCI Adapter MiMoXR WL-151"
"Hawking HWC54GR Hi-Speed Wireless-G CardBus Card"
"Hawking HWP54GR Hi-Speed Wireless-G PCI Card"
"ASUS 802.11b/g Wireless LAN Card"
"AT&T Plug&Share 54 Mbps Wireless PCI Adapter"
"AT&T Plug&Share 54 Mbps Wireless Cardbus Adapter"